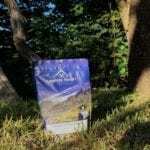 We’ve been travelling full-time for a while now. And some places we get to are really remote. We might not see anyone for days. So you’d think a portable jump starter would be an essential item, right? Wrong. For reasons unknown, I delayed the purchase. Luckily, we haven’t needed a jump start. Although, we’ve encountered others who have. Unfortunately we couldn’t help them. Why A 12V Portable Jump Starter For A 24V Truck? We can now. 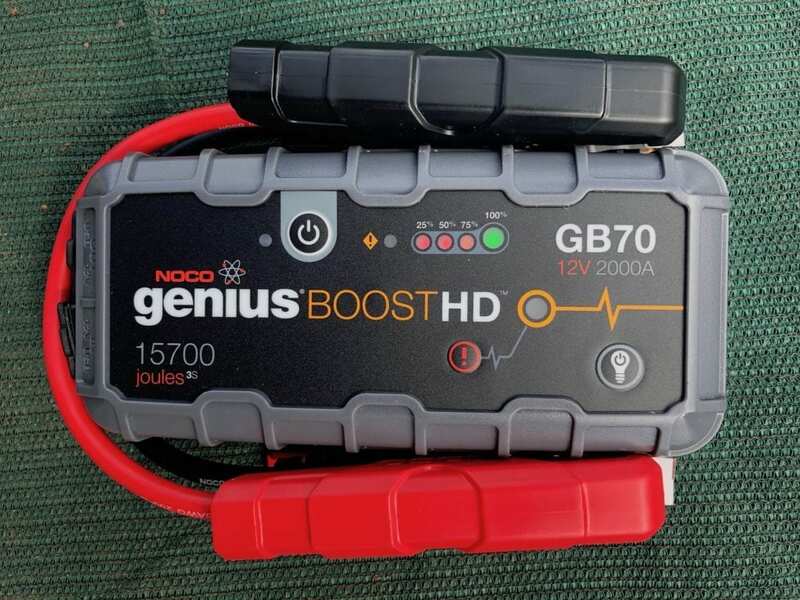 We’ve just bought a portable jump starter… a NOCO Genius Boost HD GB70 to be precise. The GB70 charger unit. The battery clamps are permanently wired to the unit. A USB to micro-USB charging cable for charging the unit from a standard 2.1A USB outlet. A cable and adaptor plug, which can be used to charge the unit from a lighter socket or to charge devices from the unit. 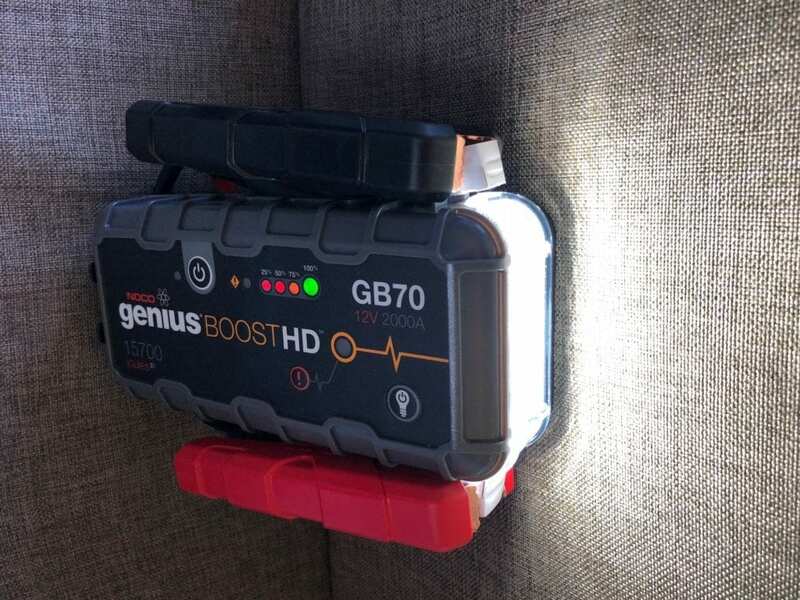 A built-in LED flashlight that has a flashing emergency mode. 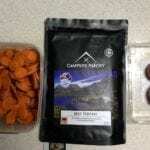 The package. Don’t throw the box out, it has useful stuff written on all 4 sides. The GB70 is a big beast. It’s designed to start up to 8 litre petrol and 6 litre diesel engines. With a peak current draw of 2,000A this monster should start anything we encounter pretty easily. At over 200mm long, 150mm wide and 65mm high and about 2.5kg, it’s a big unit. And the battery clamps have jaws a saltwater crocodile would be proud to call their own. 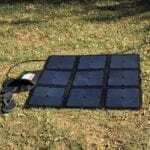 It’s for 12V lead-acid batteries only and despite its size, can be used to start vehicles with much smaller batteries. After all, the vehicle will only draw what current it needs. This might seem illogical at first. However, we wanted something we could use on any vehicle. After talking with a couple of blokes from Isuzu, they assured me they regularly use these 12V units to start 24V trucks. You see, two things are most likely to happen. 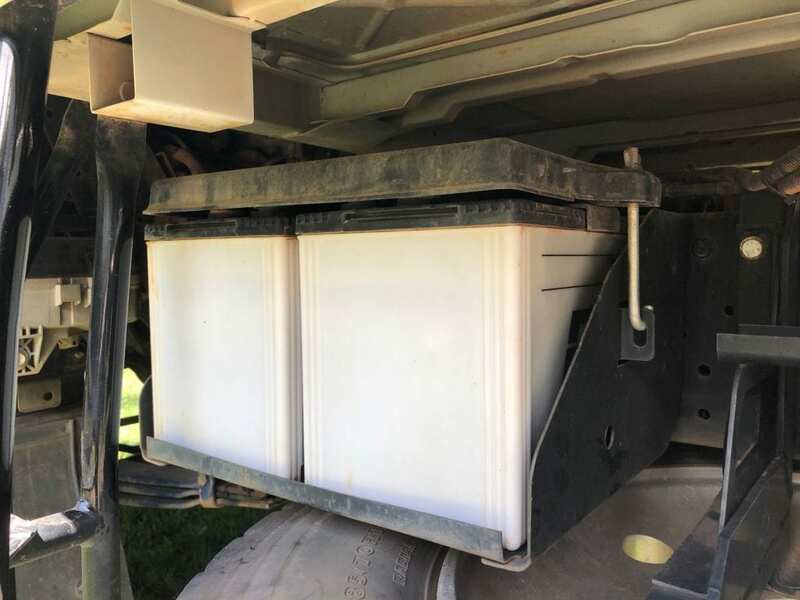 The most likely is a cell will break down in one of our 2 starter batteries… especially since they spend most of their lives being pounded to death over corrugations and rough roads. Sooner or later one of these will say enough’s enough and expire. In this case, we’ll connect the NOCO Genius to the dead battery. The other scenario is we’ll accidentally drain both batteries. In this case we can disconnect the terminals and dump a charge into each one. And last but not least, when someone approaches us with that slightly embarrassed hangdog look, asking if we have a portable jump starter then we can help them! This has happened twice already while we’ve been on the road. The NOCO Genius has a lithium battery. This can be charged in two ways. The first is to use the supplied USB to micro USB cable and plug it into any 2.1A USB outlet. The USB to micro USB charging cable. Our unit was about 50% charged out of the box. We charged it using a 2.1A USB socket in our cab. It took a couple of hours to fully charge via the USB cable. At first, the micro-USB charging input looks ridiculously tiny when compared to the size of the portable battery charger. We were sceptical whether it would charge, but it does the job perfectly fine. The second is to use the supplied cable to plug into a lighter socket. We haven’t tried this, but have no reason to suspect it wouldn’t work. The lighter socket/plug/cable combination. Shown here in “charge the NOCO” mode. Strangely, there’s no option to charge the unit from 240VAC. I assume NOCO have decided nearly every vehicle has a 12V lighter socket (our truck only has a 24V socket) and/or a 2.1A USB outlet in their vehicle. If you keep it in your garage or workshop, simply use a USB to 240VAC adapter plug. The NOCO can also be used as a charger for your devices. You can plug in a USB cable to charge any of the zillion electronic devices we all carry now. The various charging/charger cables all plug in one end, clearly marked Out and IN. They each have a separate splash proof cover. Or use the supplied cable with its clever reversible plugs. Connect the supplied lighter socket to the cable and plug in any device with a male lighter plug. Clever! Shown here in “NOCO, charge something with a lighter plug” mode. The packaging explains the mysteries of the lighter plug/socket/cable combo. On one end is a 400 lumen LED flashlight, which could double as a lightbar. Only joking, though it’s super-bright on the highest setting. There’s 3 modes of varying brilliance, 2 emergency flashing modes and one strobe mode. Not exactly a pocket flashlight, but useful nonetheless. The flashlight could be useful if you’re trying to jumpstart a vehicle in the dark. However, the unit isn’t exactly small and lightweight. 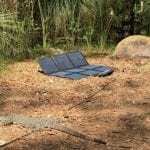 So you wouldn’t use this as your go-to flashlight around the campsite. 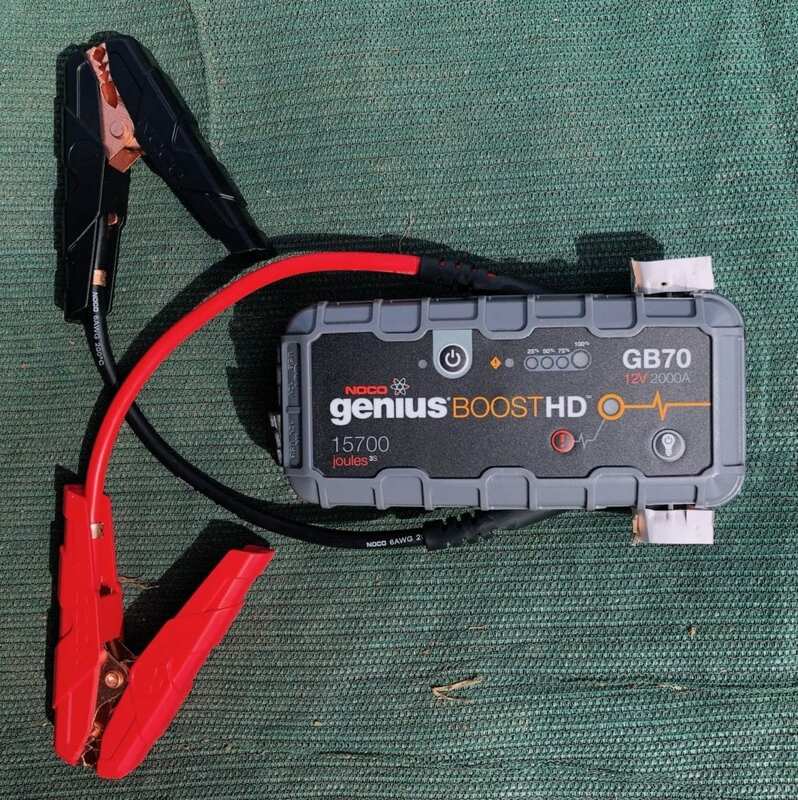 Clearly the NOCO Genius is a battery jump starter, this is its primary role. We haven’t had to use it yet, so can’t comment on its primary function. There is a manual override button you can use to charge a battery that’s completely dead. The User Manual explains how to use this mode. This is a “get out of jail” mode and should be used with caution. Nonetheless, the function is available if you’re really stuck. As soon as we use it in anger, we’ll update this article and let you know how it performs. If nothing else, we now have peace of mind when travelling remotely. There’s nothing worse than turning the key and nothing happens, especially when you’re a long way from help. With the NOCO Genius Boost we can get ourselves out of trouble, and help the occasional stranded driver as well. A worthwhile investment. 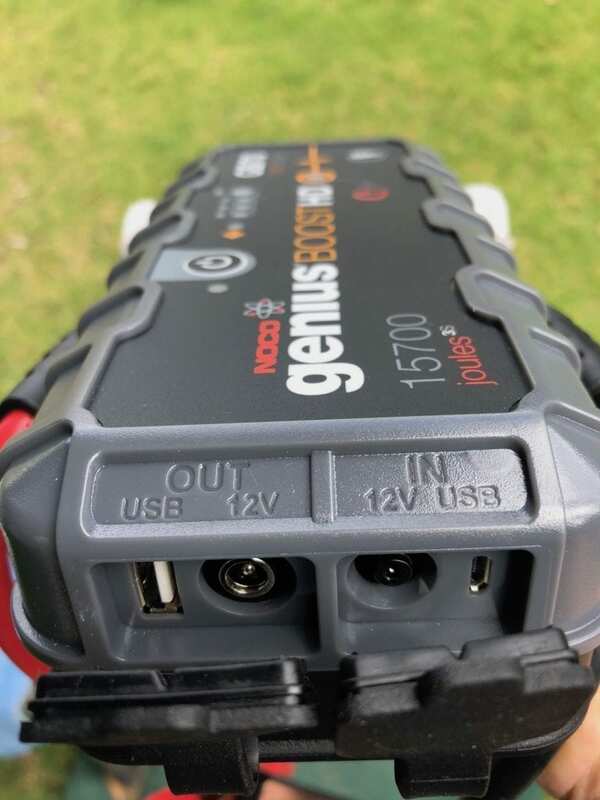 If you’re looking to buy a NOCO Genius Boost portable jump starter, you can buy it online at Amazon Australia. 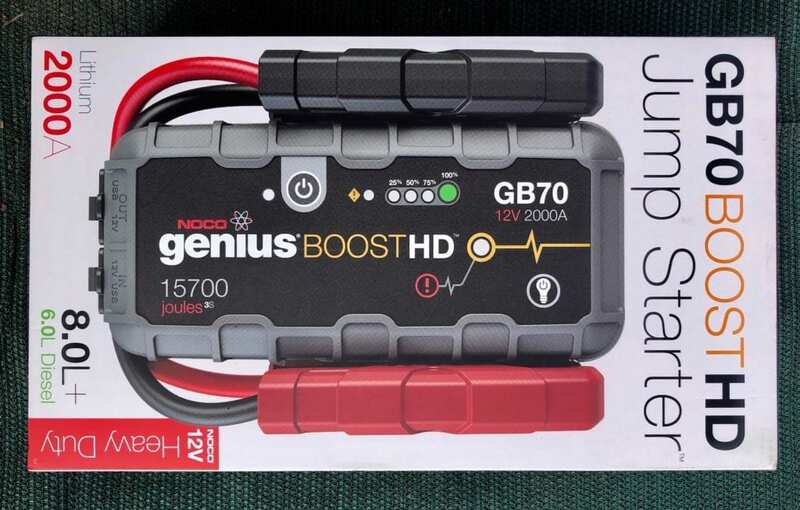 Note: We purchased the NOCO Genius Boost GB70 portable jump starter at retail price. We have no affiliation with NOCO.